My review of Siege and Storm, the second book in Leigh Bardugo's Grisha Trilogy which begins with Shadow and Bone, represents something very rare for me (at least in the past five years) and for this blog - a review of a sequel. Since I started reviewing books here, I've felt like I can't spare the time to continue reading and reviewing a trilogy or series since there are so many other books out there waiting to be read and reviewed. And, in most cases, if I like a book enough to read and review the first title in a series, the rest should be just as good. However, the first book in this trilogy, Shadow and Bone, was such a compelling read and the characters and setting Bardugo created so hard to forget that I allowed myself the luxury of time to read (listen to, really, and this trilogy is wonderfully narrated by Lauren Fortgang) and I am so glad I did. There were many moments when I found myself riveted and stock-still as I listened to this story continue to unfold over the course of Siege and Storm. The second book in a trilogy usually suffers a bit for being a bridge book. 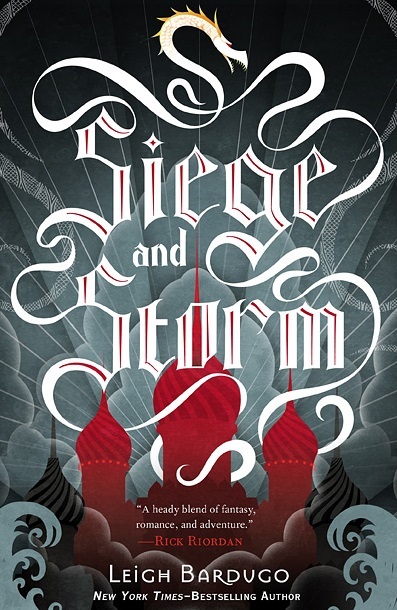 However, Siege and Storm feels every bit like a stand-alone book, one that improves on its greatness if you know the back story of Alina Starkov and the world she lives in as detailed in Shadow and Bone. I am going to assume that anyone reading this review has read Shadow and Bone and I am going to do my best NOT to give away major plot details here. In the interest of keeping one fantastic twist a secret, there is a character new to the story who has many names but shall be referred to only as "Sobachka" for the purposes of this review. As I mentioned in my review of Shadow and Bone, Bardugo is a gifted writer who creates a familiar yet foreign land in Ravka and its neighboring countries where this story is set. And, while the magical skills possessed by the Grisha are fascinating as is their conscription into the King's army and how the rest of the population, not to mention other countries, feel about those possessing these powers, adding a fantastic social layer to the story, for me, the most compelling aspect of Shadow and Bone is the character of Alina herself. Where Katniss Everdeen became a pawn for both the government and resistance in The Hunger Games, Bardugo explores the manipulation and exploitation of a hero in even greater depth in Siege and Storm. The power that Alina discovers in the first book is almost instantly usurped by the Darkling, in the name of the King. In Siege and Storm, there are even more powerful men who seek to control Alina's gift and her rapidly rising status as savior of Ravka, destroyer of the Fold and saint reborn. From the King, to the Apparat, a religious zealot amassing a rapidly growing following of pilgrims, to the hard to read Sobachka. It is fascinating to watch Alina demand and be given power - she becomes the head of the Second Army, comprised of the Grisha - while she struggles with her newly amplified abilities and constant reminders from the mostly absent Darkling that they are intimately connected. Where there is dark there is light. Returning to the Little Palace, Alina manages to earn the respect of her fellow Grisha and former classmates while also breaking down much of the divisions between the different orders of Grisha as well as the separation (and scorn) between the first and the second armies, which is thrilling to watch. Working together, they manage to make plans and weapons that just might defeat the Darkling who has tapped into an even darker, more destructive power and discovered a way to be with Alina even when he is hundreds of miles away. And, of course, there is Mal. The complexities of Alina and Mal's relationship continue to deepen, moving the story even farther away from the typical underlying romances that are woven into most fantasy and dystopian works. Of course, there are the day-to-day issues to deal with, the biggest of which is the fact that Alina has agreed to keep their relationship secret, but the growing sense of uselessness and discontentment that Mal feels. His status as a soldier having been stripped, he finds powerful but painful ways to validate himself in Shadow and Bone. Beyond Mal's struggles, Alina has to come to terms with the fact that, to put it unfairly simplistically, she has some crazy superpowers that might even make her more than human and are possibly affecting her sense of self and humanity every time she uses them. I can't wait to see how all of the issues, not to mention the amazing plot details that I couldn't talk about here, are resolved in the final book in this trilogy, Ruin and Rising, due in 2014.